“Sports leaders are faced with an atmosphere that is very competitive, fluid, spontaneous and involves a tremendous amount of press,” says Michael Schulman*, CEO of the Anaheim Ducks Hockey Club and the chairman of the Board of Anaheim Arena Management (AAM). From left to right: associate professor Hank Adler, CEO Michael Schulman and Dean Reggie Gilyard are all smiles at the 2017 Spring Distinguished Speaker Series. Earlier this month, the Argyros School of Business and Economics hosted the annual Distinguished Speaker Series event featuring CEO Michael Schulman. The Argyros School invited Mr. Schulman to speak to the Chapman community about the business and sports experience he has accumulated in the 11 years working for the Anaheim Ducks Hockey Club. 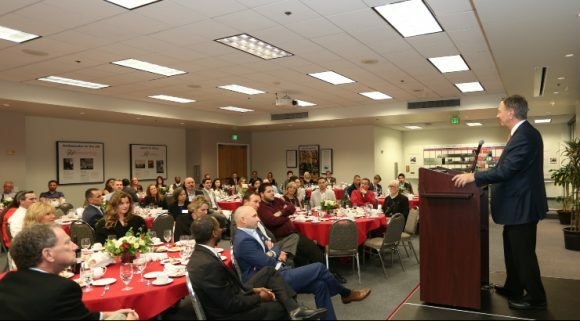 The evening event drew an attendance of approximately 120 guests including Argyros School undergraduate students and MBA students, as well as Chapman students, faculty/staff, alumni and guests. The Spring Distinguished Series event kicked off with appetizers and beverages, was followed by an introduction from Dean Reggie Gilyard, and then guests enjoyed a plated dinner. Once guests completed their meal, Mr. Schulman was invited on stage to share career tips, sport industry insights, and business anecdotes. “In the sports industry, one cannot create an idea, patent it, and then be the only team that does it. As soon as a team comes up with a good idea, there are 29 teams that will automatically copy it,” says Mr. Schulman. Mr. Schulman demonstrated his notable experience with a diverse career in law, business and sports. 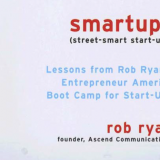 He also continued to distinguish himself as a significant speaker and business pioneer. “… Therefore, innovation in sports stems from the ability to look ahead and determine what you can do differently from the year before,” adds Mr. Schulman. CEO Michael Schulman shares numerous business stories from his varied career. “We are in the entertainment business so make no bones about it, we are there to entertain you,” Mr. Schulman remarked. Many event attendees walked away from the Distinguished Speaker Series event with a strong impression of Mr. Schulman’s business expertise and varied experience in the business sector and sports industry. “I love how Chapman brings a dynamic variety of business pioneers and thought leaders to the table. I’m not a hockey guy, but tonight I learned a great deal from one of the best in the business,” shares Jared Moriarty MBA ’13, member of the MBA Alumni Association and Associate Principal Consultant at McDermott & Bull, an executive search firm. Moriarty wasn’t the only attendee to rave about the beneficial tips that students and alumni can acquire by attending the Spring Distinguished Speaker Series and additional Argyros School events. 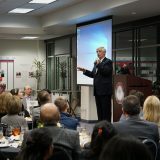 “Students not only get an opportunity to hear from a highly successful executive from the community about business and success, but they also get to network with a variety of individuals from the Argyros School including the dean, faculty, alumni, and fellow students,” says Joel Pearson, Interim Director of Argyros School Career Services. If you attended the Spring 2017 Distinguished Speaker Series and would like to view event photos, please visit the Argyros School Facebook album. Please feel free to tag any event attendees you recognize, and share these photos with friends. *Most of Mr. Schulman’s quotes were originally published in the 2017 edition of the Argyros Brief and are now featured in this blog post. Michael Schulman is the chief executive officer (CEO) of the Anaheim Ducks Hockey Club and the chairman of the Board of Anaheim Arena Management (AAM). He also serves on the board of NHL Enterprises and is the managing director of H&S Ventures, the entity that manages the Samueli Family Office. Michael has worked with the Ducks for more than 11 years. 17 people shared or liked this.